Lederhosen is an establishment of self-purported German goodness which made it perfect for a catch-up drink with Cuz. Cuz is the guy I roast pigs with and helped me develop my love of Slivo. When we get together the food must be good but it is also a huge plus if it substantial. Ours is a hearty friendship best celebrated over large beers and the honest, robust vittles of a cold place. What drew me in were the simple yet abundant signs branded by German beer companies advertising bier, wuerste, and courtesy to neighbors. So I walked down the long entrance ramp that ends at the eight-stool bar and easily found a seat, given that it was six in the evening. Sitting at the bar, on the right was a Norman Rockwell setting of a converted basement living room with a window about six feet up the wall, a couch, two chairs and an antler chandelier. To the left was a narrow hall filled with kegs flanking both a walk-in refrigerator and the door which I assumed led to the kitchen (based on the hearty young man dressed as a chef who would pop out from time to time and walk into the refrigerator, only to reappear with a bottle of beer in his hand and return through the door from whence he came). Having a fifteen-minute lead on the expected arrival of my compatriot, I decided to order both beer and food. For beer I deferred to the bartender, requesting something fitting the warmish spring weather. 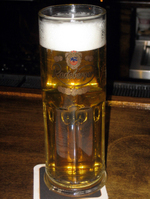 What he produced was a long, thin half-liter mug of Radeberger draft. Hoppy, sweet, and decidedly German in its lack of effervescence, it set a mood that made me wish the large open room full of tables with the mural of hills in the back contained both local revelers and tourists learning drinking songs from each other. With beer in hand I turned my attention to the menu. Thirty-two numbered offerings were presented starting with Vorspeisen und Salate (appetizers), Suppen (soup), and continuing along through Wuerste (sausages), Lederhosen sandwiches, Mittagstisch (lunch specials), Fischgerischte (fish dishes), and Hauptgerichte (dinner plates). The numbers end when dessert begins. Since the sign that drew my culinary attention had advertised "Wuerste & Bier," it made sense to order wuerste. My hunger, combined with Cuz's imminent arrival, seemed to prescribe a healthy order, so I requested the bartender bring sausages numbers 11, 12, 13, and 14: the Knackwurst, Bauernwurst, Weisswurst, and Bratwurst, respectively. Translated, for those who don't speak German: boiled beef and pork frankfurter, grilled beef and pork sausages, broiled or grilled veal and pork Bavarian sausage, and grilled German style pork sausage. Each was to be served on "a crusty roll with red cabbage, sauerkraut, onions and mustard." Of course, once I placed this order the bartender pointed out the party platter for four, which had five different sausages, sliced crusty bread, and spicy mustard; Cuz and I are both the opposite of shy retiring flowers, and a fifth sausage sounded sensible. In order to make sure we had all the components we would have gotten had we ordered individually, I ordered a side of white sauerkraut. The party platter gave us the four aforementioned wuerste plus kielbasa (meaty grilled beef and pork sausage) so our focus turned back to the beers. Somewhere between the second Radeberger and the first Spaten our mixed plate of sausages and side of kraut arrived. Light in both texture and flavor, I suspect from the crispness of skin that all five sausages had been immersion-fried before either being grilled or left as they were. In general, we preferred those with deeper char -- kielbasa, knackwurst, and weisswurst -- to those without. Across the board we found them all refined in comparison to our previous German sausage exposure and pleasing as a result. I will admit, however, that I don't see the cost benefit in forfeiting whole rolls, sauerkraut, and onions in favor of a fifth type of sausage for seventy-five cents. Besides enjoying good sausages in an pleasant room leaning to, but not hitting kitsch, Lederhosen affords you the opportunity to discover how Killepitsch plays the Pepsi role to Jagermeister's Coke after you have let HB take you to the two total liters of beer consumed point (an appropriate stopping point in the early evening). 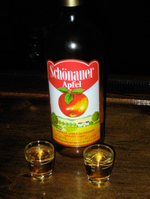 Plus, you may be able to convince the bartender to join you in a shot of that apple schnapps he is bidding you auf wiedersehen with, which is honestly the best way to leave a bar -- all caught up with new places and old friends. Sometimes the best way a place can contribute to your evening is by confidently staying out of your way and simply offering you fodder for your revelry; Lederhosen does just that.